Starring in the face of adversity, Boulder City High School’s baseball team looks to regain its focus, after dropping its first league contest of the season Monday, April 23, to rival Virgin Valley 4-3. 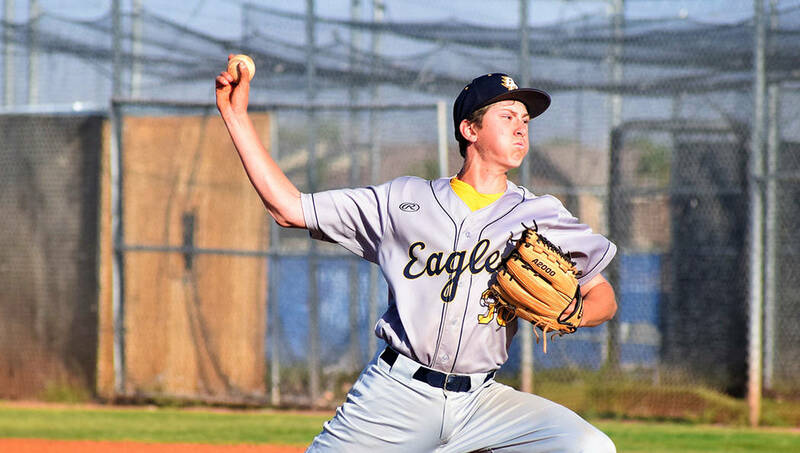 Robert Vendettoli/Boulder City Review Boulder City High School freshman Joey Giunta, seen on the mound in the Eagles' game against Sierra Vista on April 16, picked up the win April 19 against Del Sol. After walking off the Bulldogs earlier in the season for a 3-2 victory, Virgin Valley played the spoiler Monday with a walk off of their own. Leading the Bulldogs 3-2 heading into the bottom of the seventh inning, the Eagles weren’t able to hold off their rival. After tying the game 3-3, Virgin Valley slugger Joshua Abbott singled home Dakota Munford to seal the winning effort. Senior Rhett Armstrong was charged the loss after allowing three runs, two unearned in two innings, where he struck out five batters but allowed five hits. Senior starter D.J. Reese was nearly flawless through four innings, allowing one run on three hits, but was unable to gain any run support with the Eagles’ bats going cold throughout the game with only three hits. “I’m honestly sick after this loss because we had opportunities to put this game away,” head coach Ed McCann said. “I thought our pitching did really well for us on Monday. It was our bats that went cold. We know we’re a better team than what we showed against Virgin Valley. We came into the game on a roll and then couldn’t hit anything. We need to do a better job of driving in runners in scoring position when the game matters most. Unable to collect timely hits, freshman Joey Giunta (1-for-3) came through with a sixth-inning RBI single to drive in freshman Matt Felsenfeld. Providing sacrifice RBIs for the Eagles, Reese (third inning) and senior Teddy Lobkowicz (fifth inning) each drove in a run despite going hitless. Not having that problem the game prior, the Eagles routed Del Sol 17-7 on April 19, which gave them their fourth consecutive game with double-digits runs before Monday’s defeat. Collecting 14 hits, senior Nolan Herr finished 2-for-2 with three RBIs and a double, while Armstrong finished 3-for-4 with two RBIs and two doubles. Senior Chafton Temple finished 2-for-4 with two RBIs and a double, while Giunta picked up the win on the mound after throwing 3 2/3 innings where he allowed two runs on four hits, with six strikeouts. Staying atop the 3A Sunrise League standings, the Eagles look to rebound Friday, April 27, against rival Moapa Valley on the road, before hosting Chaparral on Monday, April 30. Confident in their abilities, the Eagles hope to finish the season strong.